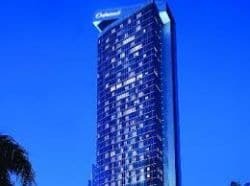 Oakwood Jakarta is a high-class serviced apartment hotel centrally located in Mega Kuningan, one of the latest commercial developments in Jakarta. The hotel features a mix of deluxe, comfort and attention to details. It has fully equipped apartments that combine hotel features with the advantage of feeling home in one environment. The hotel also provides a Kids play area, onsite convenience store, a gym, restaurant and bar, a lounge area, an outdoor swimming pool, WIFI internet connection and also onsite hair salon, pharmacy, florist and a bank. The hotel is ideal for golfers staying for a longer period of time.